KLARA ASTROM | Wing | Pinewood-Los Altos Hills | 5-9 | Sr.
Not only did Astrom score (16.0 ppg), rebound (6.9 rpg) and shoot 3s nearly as well and as often as teammate Hannah Jump (220 attempts, 38 percent), she routinely guarded the opposing post player. 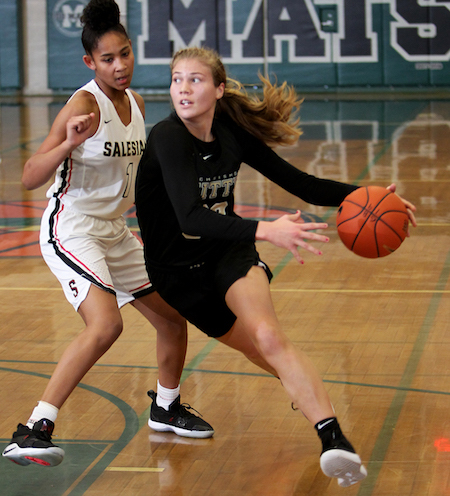 That included two members of the 2019 All-NorCal Girls Basketball First Team, Ali Bamberger and Angel Jackson. 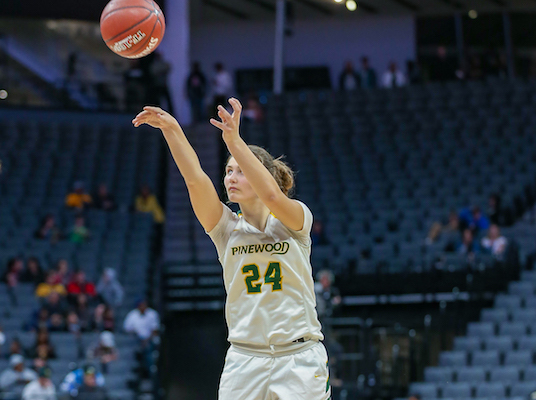 And despite giving up six inches or more to each of those future Pac-12 players, her defense helped Pinewood beat Carondelet and Salesian on its run to the NorCal Open title. The Washington-bound post was a beast on the block all year long, but her game was more than just size and physicality. Bamberger’s skills around the basket allowed her to impose her will on almost all of Carondelet’s opponents. Plus, her inside game opened up the floor for her perimeter-shooting teammates. ANGEL JACKSON | Post | Salesian-Richmond | 6-4 | Sr.
Jackson, who will play for USC next year, capped a great career with a trip to the McDonald’s All-American Game. She also led her team to the NorCal Open finals. Jackson steadily improved throughout her time in high school, and though always an outstanding defender and shotblocker, she added range to her jumper and a deft touch to her passing by the time she graduated. 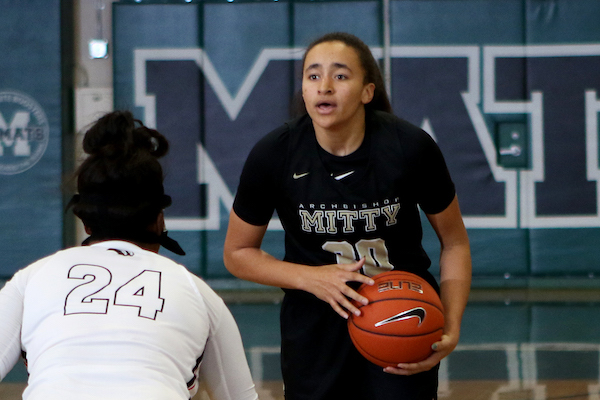 Jones was merely the player of the year for some national outlets, and often tabbed as the best prospect in the Class of 2019 — and local fans will get to watch her grow her game at Stanford. Jones’ biggest advantage is versatility at both ends of the floor, and she plays the game with a basketball IQ few her age can match. HANNAH JUMP | Wing | Pinewood-Los Altos Hills | 5-11 | Sr.
Everyone knew Jump was going to shoot 3s — but they still couldn’t stop her. She made 39 percent of her 235 attempts en route to averaging 16.7 ppg. 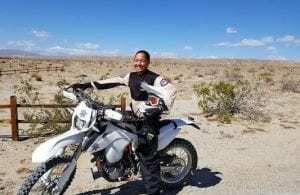 And she wasn’t just a jump-shooter. Jump pulled down 5.8 rebounds per game for the NorCal Open champs as well. 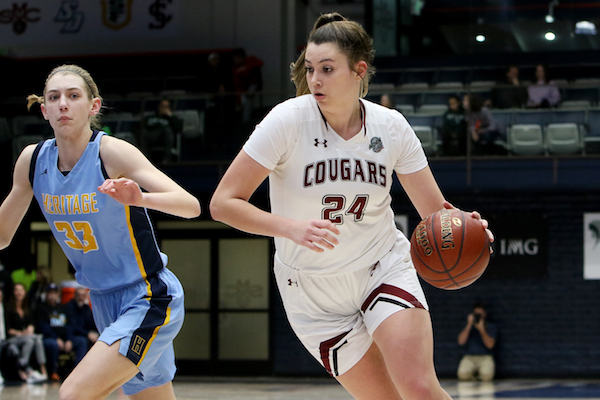 ANYA CHOICE (Cardinal Newman-Santa Rosa) | Guard | 5-8 | Jr.: With Choice running the show, she and Avery Cargill were a backcourt matchup nightmare for opponents. She can shoot it, get to the rim and defend — and she’ll be back next year. MYA BLAKE (Bear Creek-Stockton) | Guard | 5-4 | So. 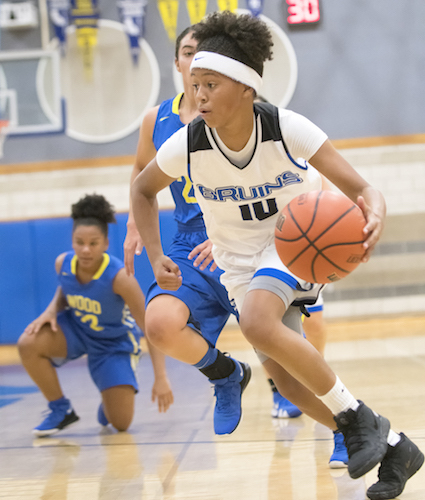 : Blake finds her way onto the 2019 All-NorCal Girls Basketball squad after leading the Bruins to the Div. I NorCal finals. She averaged 20.4 points, 3.9 assists and 4.2 steals per game. KENNEDY JOHNSON (Bishop O’Dowd-Oakland) | Post | 5-10 | So. : If Johnson hadn’t been sidelined by an Achilles’ injury for much of the season, her averages (14.7 points and 8.4 rebounds) would have been higher — and conceivably so would her placement on this list. JORDAN SWEENEY (Heritage-Brentwood) | Guard | 5-7 | Sr.: Everything Heritage did during its most successful season ran through Sweeney. The Idaho State-bound talent averaged 14.5 points, 6 assists, 3.6 rebounds and 3 steals. 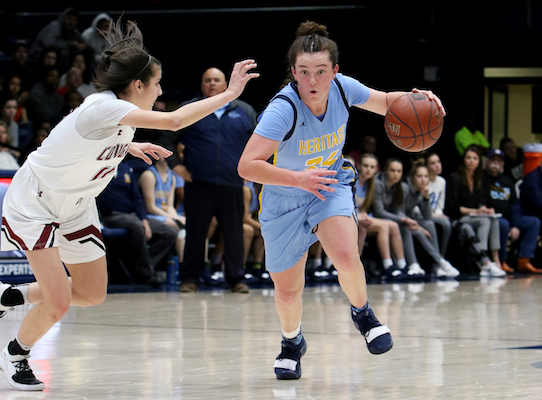 AVERY LEE (Menlo School-Atherton) | Guard | 5-8 | So. 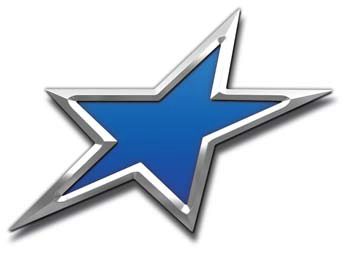 : Menlo School rolled to the CIF Div. II state title thanks in great part to Lee, a team captain as a sophomore. She led the team in scoring (16.9), assists (3.8) and steals (3.2). 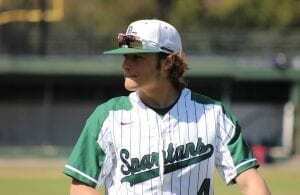 HUNTER HERNANDEZ (Archbishop Mitty-San Jose) | Wing | 5-9 | So. : It’s clear the Monarchs will be in good hands post-Haley Jones. Hernandez was second on the team in scoring, rebounding and assists and had a 2:1 assist/turnover ratio. MALIA MASTORA (St. Joseph Notre Dame-Alameda) | Wing | 5-10 | Jr.: Mastora led surprising St. Joseph Notre Dame into the Open Division, topping the Pilots in scoring by averaging 14.8 per game. She also led in blocks at 1.8 per game..
MIA MASTROV (Miramonte-Orinda) | Wing | 5-11 | So. 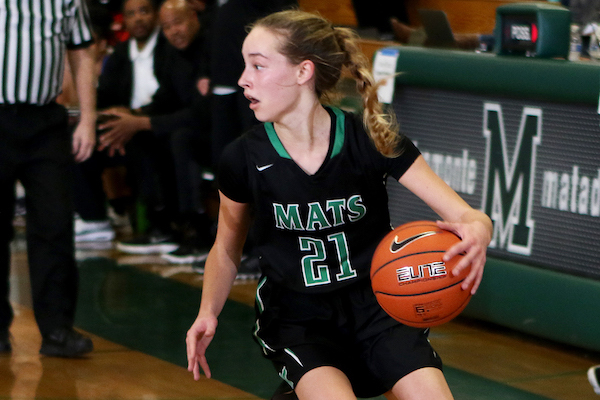 : Mastrov broke out this season, leading 28-4 Miramonte with 15.5 points — on both 3-pointers and slithery moves to the hoop — and 6 rebounds per game. She’s also an outstanding defender. JADYN MATTHEWS (Enterprise-Redding) | Forward | 5-11 | Sr.: Despite her 21.9 points and 10.2 rebounds per game, Matthews isn’t as well known as others on this list. 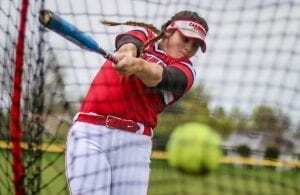 But, largely thanks to her, Enterprise went 28-6 and deep in the NorCal Div. II playoffs. There is ALOT of top notch talent in the sophomore class!! Right?! Definitely a very bright future (and present) for NorCal girls hoops. Thanks for weighing in, Lou.